Finnish startup company, called Jolla, has announced the Jolla Tablet shortly after launching their smartphone model. As the first tablet, Jolla has big plans for their device and to those interested to use the tablet. 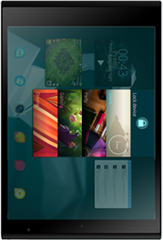 Just like its smartphone counterpart, the Jolla Tablet runs on Sailfish OS; an open-source platform that still manages to run Android apps and native software. On the forefront, the Jolla Tablet is equipped with a 7.9-inch 2048x1536 pixel resolution display that makes for a quality tablet for playing games and watching videos. The device is powered by a 1.8GHz Intel quad-core processor and comes with 2GB of RAM. As for storage, the Jolla Tablet comes with 32GB internal storage but may still be expanded up to 32GB through its microSD card slot. The two cameras on the tablet are pretty decent with a 5MP rear camera and a 2MP front-facing camera. Memorable moments may be captured on film in HD quality to make special events a lot more cherishable. Other notable features included on the Jolla Tablet include ambient light sensor, accelerometer, proximity sensor, Bluetooth, GPS, and Wi-Fi connectivity. Together in its box, the tablet comes with a micro USB cable for charging and a quick start guide. Last summer I checked out the intriguing Jolla smartphone.